For years I have been blaming Hallmark for commercializing Valentine’s Day. But I was wrong. The commercializing was brewing for a few centuries. The life and times of St. Valentine dates back to the third century when tradition tells us Valentine was thought to have arranged marriages in secret, which was considered treason by Claudius II. Claudius believed married men made bad soldiers. As a result of the secret marriages he performed, Valentine was sentenced to death for his crime. In prison, Valentine supposedly fell in love with the jailer’s daughter and sent her a love letter signed, “from your Valentine” on February 14th, the day of his execution. Fast forward to the 18th century because little is known of Valentine or this romantic day until then. During this period in England, sending anonymous Valentine cards became popular. 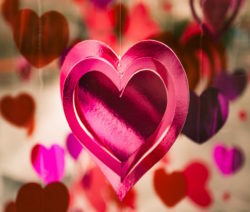 Hallmark enters the scene in 1913 and today we have a billion cards exchanged every year along with Valentine Day pizza, flowers, candy and drinks. All lovely, symbolic gestures. Sorry for the lengthy lead into the real purpose of this article. For centuries we have a special day to focus on love. The same is true for Thanksgiving. – A day to focus on gratitude. I would like to believe these two days are reminders to us to always focus on love and to always focus on gratitude. These two days should be reminders of our making efforts toward the other 364 days. These are the two days for us to ask ourselves, “Am I being loving, am I being grateful?’’ What can I do to be more, do better in these two important areas of my life? Like Valentine, am I willing to give to give enough of myself to be life giving to another? What would our marriages, relationships be like if we said, “I love you,” more often, sent supportive cards, small gifts, performed small acts of thoughtfulness? The exact same thing is true of gratitude. What if …every day? So good for our hearts, so good for our families, so good for the entire world.